Summary: Told with Beth Harbison's wit and warmth, If I Could Turn Back Time is the fantasy of every woman who has ever thought, "If I could go back in time, knowing what I know now, I'd do things so differently..."
Every once in awhile, I just want to read a book that allows me to escape from it all. 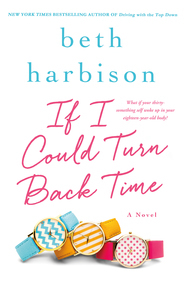 Thankfully, the day I got a flat tire on the highway and ended up waiting 5 hours to get my tires replaced, I had a copy of IF I COULD TURN BACK TIME by Beth Harbison. This novel was definitely a quick and fun read that, in many ways, was like a trip down memory lane for me! IF I COULD TURN BACK TIME tells the story of Ramie Phillips, a woman who has a successful career but not exactly a happy personal life. One day she is "celebrating" a little too much on a yacht after learning that her best friend is pregnant and her other best friend is ready to adopt a child with his partner. She ends up falling and hitting her head while diving overboard, and she wakes up as her 18 year old self in her childhood bedroom! But Ramie's new life isn't all fun and games. The 38 year old Ramie knows her father will die in less than two years, and she tries to treasure each and every moment with him. As Ramie re-navigates early adulthood, she tries to figure out what she actually wants out of life and would she make the same decisions again. I enjoyed IF I COULD TURN BACK TIME. It was a cute story and definitely funny. I found Ramie to be an interesting character because she was so unsatisfied as an adult; however, I will admit that I found that her to be a little selfish at times. She embraced that she was allowed to be an 18 year old again and everything that came with it, and she definitely had few issues with reverting to the selfish behavior that teenagers can exhibit. There were times that I found her just a little to irresponsible and selfish. However, I do think that the author did a decent job of juxtaposing the fun and games that Ramie experienced with the bittersweet times with her father. Since Ramie knew her father was going to suffer a massive stroke in two years, she was able to treasure the times with him. Even though I knew that Ramie was probably correct in thinking that she couldn't change those events surrounding her father's death, I wanted her to pull those cigarettes out of his mouth and at least try! As entertaining as this story was, I think I most appreciated that Ramie's high school years reminded me of my own. Not that Ramie and I had all that similar of experiences, but I felt as if Ms. Harbison did a fantastic job of bringing the essence of that time to life. I don't spend much time thinking about my high school years and especially the time around graduation, but reading this novel definitely took me back. It even made me think about the choices I made and what I might (or might not have) done differently! If you are looking for a fun and light read, then I recommend checking out IF I COULD TURN BACK TIME. For many middle-aged women, it will be a fun way to reminisce about the past and maybe even think about the choices they made. This one sounds interesting, although it reminds me a lot of the movie, Peggy Sue Got Married, or the book, What Alice Forgot by Lianne Moriarty. Sounds fun, but I wouldn't want to return to high school! I do like reading these kinds of stories, though.